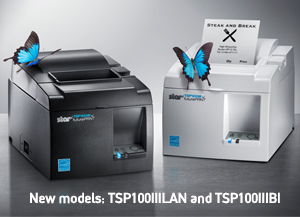 Star Micronics, in addition to the TSP100IIIW (released in February, 2016) which is a 3-inch thermal printer equipped with wireless LAN, now releases two new models: TSP100IIILAN with wired LAN and TSP100IIIBI with Bluetooth. With these two new models, the TSP100III series now consists of 3 ways of communication required for mPOS: “wireless LAN”, “wired LAN” and “Bluetooth” hoping to satisfy the expanding mPOS market demand. To connect multiple number of tablets with a printer, you have a choice between wireless and wired LAN, and to connect one with one, Bluetooth model will offer an easier setup process. TSP100III series is proud of stylish appearance and high functionality, which is of course taken over to these new models. They can print very quickly even the graphic data at a maximum printing speed of 250mm/s. They are equipped with de-curl function (*2) to keep the printed receipt paper from curling and 5V USB port to charge mobile devices such as tablets. In addition, they are provided with special store application (*3) and online manual for easy setup and setting changes on iOS and Android devices. Their sophisticated case color (ultra white) will enhance their design feature. Starting from Japan, we will expand the sale of these two new models worldwide, including US, Europe and Asia and will target 100 thousands units of sale by the end of fiscal year 2018. We have been proud of high market share in mPOS printer but will try harder with the introduction of these new models. (*1) ｍPOS（mobile Point of Sale）. Normally tablets are used in this POS system. Compared to conventional POS system and to those with PC, initial cost for introduction can be lowered. (*2) Subject to usage of our recommended paper. (*3) Special applications which are downloadable from App Store or Google Play. » High functionality and convenience to mPOS usage are succeeded from TSP100III series, keeping compatibility with the conventional TSP100LAN. » Certified the Apple MFi license program to communicate with iOS devices such as iPhone and iPad. » Diagnostic mode to detect network and communication status. » Easy setup guide, web configuration and link to manual by QR code are provided for any mPOS users to set up communication with network and mobile devices.